So you have your venue. You’ve got the dress. The bridesmaids look amazing. The cake looks delicious. You are ready to welcome friends and family along to celebrate with you. What’s missing? I’ll tell you what. Having a live acoustic singer perform at your big day! What do I mean by acoustic wedding singer? Well, I mean someone playing a live instrument and performing live vocals for you and your guests. Acoustic is defined as ‘not having electric amplification’ but this is not always the case. In modern times, acoustic has come to mean stripped back and chilled versions of popular songs. It is songs performed the way they were written, most often on guitar or piano. Of course, it is possible to hire a singer who sings to backing tracks and pre-recorded music. But in my opinion (and I know that I’m a little biased) you can’t beat an acoustic guitarist and singer. Adaptability – An acoustic guitarist and singer is able to respond to the crowd very effectively. Is everyone singing and clapping along? Want to repeat a chorus for a singalong? No problem! Equally, if a song is not working out too well, an acoustic wedding singer can mash up the tune into another song or start a new song from scratch, straight away. No need to press pause or skip on a backing track. Authenticity – Singing is a skill, and accompaniment on a live instrument is even more impressive. Combine the two and you have unforgettable showmanship – a highlight of the day that guests will always remember. This was certainly the case at a recent wedding I performed at in Italy, which you can read about HERE. Range of songs. When playing a live instrument, you don’t need to worry about having the right backing track, or fear that you are missing any songs. Just take instant on-the-spot requests from guests! Read more about my top 5 acoustic wedding songs or view my full repertoire. So what about me? I have been providing acoustic wedding music on guitar and vocals for many years, all over the south east of the UK but principally in Essex, Herts, London and Suffolk. 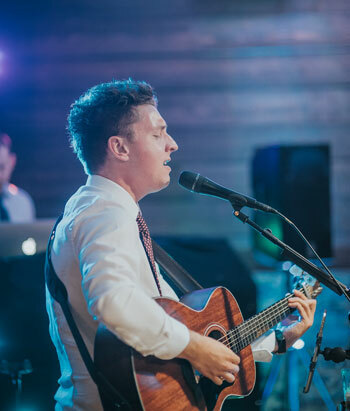 I can play at any part of your day, be it the ceremony, drinks receptions, meal or first dance (read more about my services here) and I also have a range of price options available. Don’t just take it from me – read more about what my past clients think on my testimonials page. Here are a few live videos of me performing. Contact me HERE for advice on planning live music on your wedding day. I can play as you walk down the aisle, during the signing of the register, and when you exit the room as a newly-married couple. I can play while your guests enjoy drinks and canapés and you have photos taken. This can be either inside or outside, depending on the weather! I can play two sets during the wedding breakfast and can take requests from guests on the spot, creating the right atmosphere leading up to your speeches. I can arrange an acoustic version of your chosen song and send you a clip in advance. I can follow this up with a lively set before the DJ takes over. “Even now, two weeks on from our wedding day our guests are still mentioning the performance of Tom. He played incredible sets for us on the day. Firstly, he executed the song of our choice better than we could have ever wished for..
We came across Tom's website and loved his music and extensive repertoire! Our wedding was in Italy and we knew it was a long shot but contacted Tom to see if he would be willing to travel over to play and we're so grateful he said yes. Tom was fantastic, he was speedy at replying to messages, relaxed about travelling long distances in very hot weather (sorry! ), and his music made the wedding so much better than we could have imagined. He played a beautiful version of a song we had chosen for me to walk down the aisle to and then played throughout the drinks reception. Everyone who came mentioned how much they enjoyed his playing and I wouldn't hesitate to recommend him!